Everyone's got a favourite Resident Evil era. For the sixth game, Capcom's bringing them all together. At the company's booth at E3 we got hands-on with the three distinct disciplines that have marked the franchise's sixteen year history: the survival horror, the action horror, and the relentless boss rush of Mercenaries. Each represents a different strand in Resident Evil 6's trio of stories, that together form the game's main campaign. Each, the studio explains during a later presentation, is around 80% the size of Resident Evil 5. Combined, you're looking at in excess of a thirty hour adventure: a hefty amount, even for RPG standards. At the same presentation, Capcom also drops the news the game will include four-player co-op at key moments, when plot threads intertwine briefly. The majority of each story will stick to two-player co-op, but keep online for your campaign and the game will pick a random co-op pair to join you and your partner (AI or otherwise) come specific scenes. The torchlight element aids in heightening tension in Kennedy's section. We're demoed a boss clash against new Tyrant monstrosity Ustanak, as Leon Kennedy and new partner Helena join forces with Jake and Sherry in a junkyard. The obvious question's raised post-brief about repeating content come second and third story plays. Capcom don't exactly deny the situation outright, instead stating that new story elements will bring different perspectives to situations. For the demos though we're much earlier in the game. 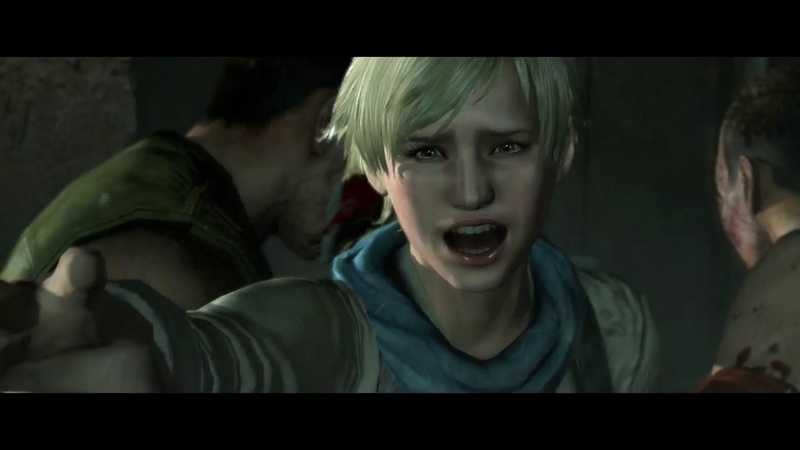 At fifteen minutes apiece these gameplay slices do the job in conveying the different play styles each narrative vein will adopt: how much all three will merge towards the story's end is unknown, but we're told this multi-part demo won't be the one released as part of the Dragon's Dogma promotion. I immediately jump into Leon's section. Survival Horror with a decent stab at slow-burn build-up mightn't be best suited to the noisy confines of E3, but its the era I've missed most of all. The time frame is just after the assassination of the zombified president, Leon and Helena sneaking through a darkened and empty political rally. There's no option to run or shoot: exposition is the focus here. While salient plot points are missed due to the exhibition's background noise, the sporadic lightning illuminating the hall's interiors retains the ambience. Even with only walk enabled, I take my time with slow camera pans. Perhaps I want to be scared more than I actually am. That illusion's further hindered by a selectable HUD GPS system that overlays the main screen with a giant arrow. Redfield's demo rarely had your finger off the gun trigger. With story shackles eventually off it's immediately noticeable how nimble Leon is. It's the same for Chris Redfield and Jake Muller, Capcom straying further again from the tank controls of the game's predecessors. The backwards leap and supine position important to dodge thrown objects and get distance, while rapid melee attacks can be chained together to down zombies or clear space in hordes. Leon's restricted to a pistol, but Redfield's not let go of his arsenal from RE5; quick switches between weapons are now possible, and the inventory sub-menu overlays on top of the on-screen action for considered weapon choice and herb usage, the latter now available as a one button healing option as well. The ex-STARS member's demo is a nighttime rooftop assault tackling gun-wielding and mask-wearing thugs. Whether they're infected with the new G-Virus is unknown, but they act stupid enough to play the part of classic infected types. They make up for it in numbers though. The pace is much faster, leaping from building to building and clearing out nests of shooters. There's clear indiction of returning co-op set-pieces, as our partner lays down covering fire as Chris clambers along a broken pipe between rooftops. Ammo drops aren't so clearly marked against the grimy surroundings, and the classic knife soon becomes the only defence. Once downed by overwhelming odds, the game shifts to a last-gasp "fight for your life" mechanic, assumedly to give your partner time to revive you. Not here though: a boot to the face ends things prematurely. In enclosed spaces made the boss fight in Jake's portion of the demo hard to contend with. Death comes even swifter in the last of the three demo sections. I was warned twice, by two different sources in Capcom, that Jake's story was the toughest. It's full on Mercenaries mode here: to pause is to die as the demo starts with a boss chase sequence, transitioning almost immediately into an extended series of evasions as Jake and Sherry are repeatedly charged by the tank-like Ustanak in a small room. "You Are Dead" flashes up far too soon on screen. While the dodge and roll technique is classic to any adventure, the closeness of the over-the-shoulder cam means we blunder into pillars and walls of the disused building we find ourselves battling in. It's an inglorious end to the trio of levels, and the charging boss type seems one element of the franchise's past thats in need of a more generous retweak. Visually the game's still in need of work, character models rough around the edges, level polish not yet to the high standards we expect from the company. But then it's still six months off its release date, and we've yet to see a core Resident Evil title that hasn't been a looker come launch. What Capcom showed at Microsoft's Media Briefing definitely points to a Resident Evil experience that's got the cinematic swing to punch its way through the pack, and the burning cityscapes as background suggest technology has finally allowed Capcom the scope of a zombie apocalypse turned war epic: Resident Evil 2 on a global scale.